His first encounter with acting was in the movie, “Back Draft”, written and produced by Ron Howard and starring Robert Deniro. His work as an actor progressed for the next six years until he secured a regular role as a Doctor on the television series, “Chicago Hope”. Unfortunately, soon afterward, the show was cancelled. There is speculation that the cancellation may have been due to the changing tax laws in Chicago. Subsequently, filming in the area dried up for many years. 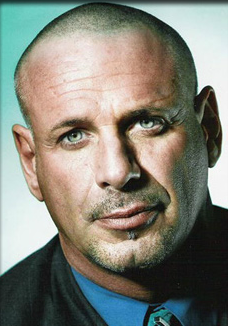 When “Prison Break” burst into television in 2005, Wagner went to work on the series first as an extra, stand-in, photo double for Dominic Purcell (“Lincoln”) and then in the role of “Presidential Secret Service Agent”. This series served as a natural step toward his passion for working in the film industry. Because of his past (and his physical appearance), Wagner takes a special interest in gangster roles. Two of his latest projects were: “Trapped In the Closet” which was a full feature R & B Opera by rapper, R. Kelly, where Wagner appeared as a bone-crushing, arm wrestling, gun toting thug and “Chicago Overcoats”, a feature film starring gangster greats, Frank Vincent, Mike Starr and Armond Asanti. In “Overcoats”, Wagner appears as “Larry”, a garage owner who is none too pleased with Frank Vincent’s character and his “associates”. When Vincent wields a crowbar, Wagner puts his real life fighting expertise on display in a fight scene that rivals any on the silver screen today. Early in 2008, Wagner will begin work as “Patriot”, the lead role in the feature film, “Brave New World”. This is a film which Wagner has assisted in development for almost two years. The movie, “Brave New World” is based on the popular role playing game of the same name, written by Matt Forbeck. Wagner bears an eerie resemblance to the character “Patriot”, as he appears on the cover of the first in the series of “Brave New World” books, entitled: “Ravaged Planet”. This character is of particular importance to Wagner because of the message the aged superhero, “Patriot”, carries throughout the film. Having experienced life on just about every conceivable side of the fence, Wagner can certainly be likened to the seasoned hero he’ll be portraying.